I just read through each of the gospels’ accounts of Jesus’ resurrection and was very struck by how Jesus’ resurrected life is portrayed. One the one hand, the physicality of Jesus’ body and the continuity of his personhood is stressed in the strongest possible terms. In Luke 24, for example, when the disciples are wondering whether Jesus is a ghost, he reassures them, “see my hands and my feet, that it is I myself. Touch me, and see. For a spirit does not have flesh and bones as you see that I have” (v. 39; cf. John 20:27). And then, because seeing the holes in his hands and feet is not enough to convince them, he eats a fish in their presence (vv. 41-43). Against the gnostics, we must affirm with the early church the physicality of Jesus’ resurrection body. And yet, there is something strange and supernatural about this physical body. 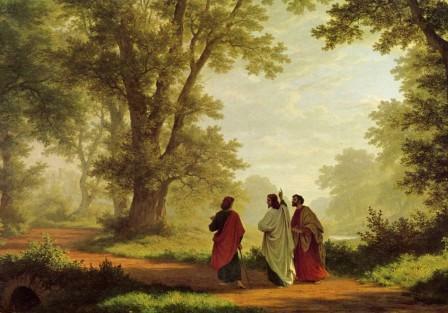 After revealing himself to the disciples on the Emmaus road, he suddenly “vanished from their sight” (Luke 24:31). Similarly, he can appear out of nowhere, even through locked doors (John 20:26). And on three separate occasions people who know him intimately do not recognize him, even when they are talking directly with him (the two disciples on the Emmaus Road in Luke 24, Mary Magdalene in John 20, and the seven disciples in John 21). Its obvious there is something different about Jesus after Easter morning. Others before Jesus were physically resurrected (Lazarus, for example, and those under Elisha’s ministry), but they came back to a normal earthly life, to die one day again. Easter is different. Easter is new. It the invasion of the future, the start of the second creation, the first fruits of the renewal God will give to believers (I Corinthians 15:20ff.) and indeed, all creation (Romans 8:20-21). At Easter, a new kind of reality emerges – one without precedent in history or eternity.